Autonomous micro aerial robots can operate in three-dimensional unstructured environments and offer many opportunities for environmental monitoring, search and rescue, and first response. I will describe the challenges in developing small, agile robots and our recent work in the areas of (a) control and planning, (b) state estimation and mapping, and (c) coordinating large teams of robots, with applications to cooperative manipulation and transport, construction, and exploration and mapping. 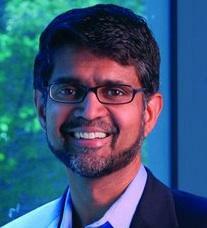 VIJAY KUMAR is UPS Foundation Professor in the School of Engineering and Applied Science at the University of Pennsylvania and he serves as Assistant Director for Robotics and Cyber Physical Systems in the White House Office of Science and Technology Policy (currently on sabbatical). His research is on robotics, specifically micro aerial vehicles and multi-robot systems. He earned a B.Tech from the Indian Institute of Technology and an MS and PhD from Ohio State University. He has been a member of the faculty at the University of Pennsylvania since 1987. He has served as Deputy Dean for both Research and Education of the School of Engineering and Applied Science, Chairman of the Department of Mechanical Engineering and Applied Mechanics, and Director of the multidisciplinary robotics and perception GRASP Laboratory. He served on the editorial boards of the IEEE Transactions on Robotics and Automation, IEEE Transactions on Automation Science and Engineering, ASME Journal of Mechanical Design, the ASME Journal of Mechanisms and Robotics and the Springer Tract in Advanced Robotics (STAR). He is a Fellow of the American Society of Mechanical Engineers, a Fellow of the Institute of Electrical and Electronic Engineers, and a member of the National Academy of Engineering. He received a National Science Foundation Presidential Young Investigator award, the Lindback Award for Distinguished Teaching, the Freudenstein Award, the ASME Mechanisms and Robotics Award, the IEEE Robotics and Automation Society Distinguished Service Award and a World Technology Network Award, among others. Vijay has published over 100 peer reviewed scientific publications, several books and numerous book chapters, and has been featured in numerous articles and film clips on robotics in popular media. There are numerous links to YouTube videos of his work on his laboratory website. President John Ingersoll called the 2,319th meeting to order at 8:19pm September 6, 2013 in the Powell Auditorium of the Cosmos Club. Mr. Ingersoll announced the order of business and introduced five new members of the Society, including the speaker of the evening. The minutes of the 2,318th meeting were read and approved. Mr. Ingersoll then introduced the speaker, Mr. Vijay Kumar of the University of Pennsylvania. Mr. Kumar spoke on "Swarms: Beyond Solo UAVs, Flying Teams of Robots." Mr. Kumar began by describing the major technology drivers behind his research. The commercial applications of swarm robotics have already been demonstrated with autonomous cars and trucks capable of automatically platooning and with reliable, high throughput warehouse inventory systems involving hundreds of small robots. Additionally, there has been an exponential growth in unmanned aerial vehicles (UAVs) since the 1980s. UAVs are currently a ten billion dollar industry with many civilian applications such as precision farming, inspection of construction sites and industrial facilities, and emergency first responders. Although there are many defense applications for large, remotely piloted UAVs, civilian UAVs are rapidly becoming smaller and more affordable, he said. Mr. Kumar explained that his research group builds small, autonomous quadrotor UAVs ranging in size from a meter in diameter to being able to fit in the palm of your hand. It is important to build the robots as small as possible given the relationships between characteristic radius and inertia, because a small robot can stabilize or rotate in fractions of a second using its onboard computer. These robots are intended to explore applications such as search and rescue and disaster response, so they must be able to operate efficiently both outdoors and indoors, without GPS, and in teams. Achieving these capabilites requires overcoming significant research challenges, he noted. 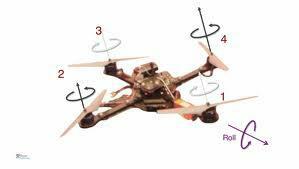 Mr. Kumar discussed how the simplest quadrotor motion is rotation, since the main control is the speed of the rotors. Therefore, to translate through space the robot must pitch to create thrust and reverse pitch to brake as it reaches a destination. This is accomplished using control software with feedback systems to control the robot's orientation and position combined with planner software to help the robot most efficiently navigate the environment to achieve its goals. This planning capability, which attempts to minimize snap, the second derivative of acceleration, creates and updates trajectories that allow dynamic performance and split second precision, including moving obstacle avoidance. Mr. Kumar continued by discussing state estimation, the process by which the robot locates itself in space, especially without the benefit of external motion capture cameras. An early prototype utilized an inexpensive depth-finding camera and fast laser scanner to locate and track features in the environment, working backwards to determine the robot's relative position. This process of simultaneous localization and mapping allows the robot to navigate and remember unfamiliar environments but has high weight and power requirements for the on-board sensors. Mr. Kumar clarified that weight and power constraints are critical to design choices. Current battery technology combined with mechanical inefficiencies make it difficult to create high endurance robots, especially when compared to biological systems, he said. Therefore, his team has focused on reducing payload weight by adopting cell phone technology for processors and cameras, replacing heavy sensors like laser scanners with more efficient stereo camera configurations. Mr. Kumar believes that swarms of aerial robots have great potential for accomplishing complex tasks in parallel. He discussed examples of coordination in an autonomous construction task and cooperating to lift objects heavier than a single robot's ability. His team also draws inspiration from swarms in nature, such as flocks of Starlings. Each bird in a flock acts independently with limited information, yet the flock forms large dynamic patterns. Mr. Kumar believes the concept of anonymity is key to this behavior, where members of a swarm react to the presence of neighbors without knowing exactly who their neighbors are. 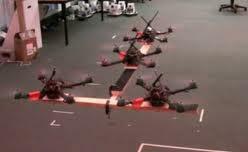 His group has explored this using multiple robots undergoing coordinated group motion and formation flying while avoiding obstacles. He believes a swarm of cooperating, inexpensive robots that assumes some level of acceptable loss would be an invaluable asset in many scenarios including emergency and disaster first response. Someone wondered why the robots have four rotors. Mr. Kumar explained that four rigid rotors is the simplest configuration capable of stable flight. He noted that three rotors would be unable to fly and five would be redundant. Another question concerned the positioning systems used inside the laboratory compared to those used in outside environments. Mr. Kumar clarified that both laboratory-frame motion capture cameras and robot-mounted spaced cell phone cameras provide positioning data with nearly one millimeter resolution at one hundred Hertz. However, a larger, heavier robot is required for the dual camera system and this is not ideal for some experiments. After the question and answer period, Mr. Ingersoll thanked the speaker, made the usual housekeeping announcements, and invited guests to apply for membership. At 9:43pm, President John Ingersoll adjourned the 2,319th meeting to the social hour.